A record 25,000 anti-Islamist protesters marched through the east German city of Dresden on Monday (12 January), many holding banners with anti-immigrant slogans, and held a minute’s silence for the victims of last week’s attacks in France. Chancellor Angela Merkel and other senior German politicians have called for people to stay away from rallies organised by PEGIDA, or Patriotic Europeans Against the Islamisation of the West – people who Merkel has said have “hatred in their hearts”. On Tuesday she will take part in a vigil in Berlin organised by a Muslim group to remember the 17 people killed in Islamist attacks at the offices of satirical newspaper Charlie Hebdo and a kosher supermarket in Paris. About 7,000 more protesters than last week turned out for the march, a police spokesman said. Leader Lutz Bachmann set out PEGIDA’s demands for the government including drawing up a new immigration law, forcing immigrants to integrate and making sure that Islamists who leave Germany to fight are not allowed back into the country. “We are getting more support each week,” co-founder Kathrin Oertel said. Mostly men over 50, many chanting of “Wir sind das Volk” or “We are the people”, they said they were more concerned about increasing immigration than the events in France. One carried a Christian cross illuminated with fairylights. Eugen Peuke, 61, was at his second protest. “It (multiculturalism) doesn’t work. Immigration is a problem. They steal. I just don’t want them here. The government isn’t listening,” he said. 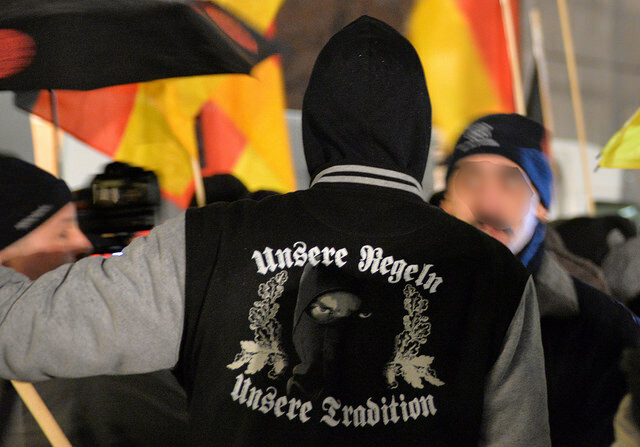 Counter-demonstrators shouted “PEGIDA, you’re racist” and “Germany is ashamed of you”, and in Berlin and the western city of Duesseldorf the rallies were dwarfed by counter-protesters. Germany has some of the world’s most liberal asylum rules, partly due to its Nazi past, and last year the number of asylum seekers, mainly from the Middle East, doubled to about 200,000 from 2013. 30,000 people attended an anti-PEGIDA rally in Leipzig on Monday night, along with 20,000 in Munich and 8,000 in Dresden. Though widely reported in the German press, these demonstrations were not as consistently covered outside the country. The Leipzig rally was launched against a local PEGIDA rally, which, according to Deutsche Welle, only drew 5,000 demonstrators. A far smaller Berlin PEGIDA event brought out 400 anti-Islam protestors, who were met by an estimated 4,000 anti-PEGIDA counter-demonstrators. In the west we learned to separate religion from politics. Jezus is a wonderful thing to believe in for your personal self but do not run a country with it. And look, we no longer kill witches or stone adulterers. What will it take for muslims to recognize that their belief is only for their personal salvation, but that the psychopaths dressed up as religious leaders should not be in charge of any worldly matters whatsoever, before they take us all to hell! Yes, we after several hundred years have separated church from politics. Then we the enlightened had non-religious NAZI and Communist states with killing sprees than gladly outcompete the IS. We are having groups that simply think others deserve dying in all societies (in our too)… they take over when society breaks down … then these lunatics appear to kill for nation, god, values, race, whatever … now we have some groups of muslim fanatics, tomorrow??? our own radicals are brewing: racists, nationalistic fanatics… what kind??? I agree with religion to get out of politics, but not your ‘enlightened’ analysis.